We have had a very interesting week on the Steem Blockchain! The witnesses and Steemit Inc. have done a great job to get HF20 over the line and it feels like activity can now begin to return to normal, and go to the next level. This weekly report provides a snapshot of posting activity on the Steem Blockchain for the past 7 days. How many accounts are active? I was particularly interested to see how the different cohorts of users responded to the Hardfork. This week there was a large drop in number of posts down from 135k (a few weeks ago) to just 68k over the past 7 days. 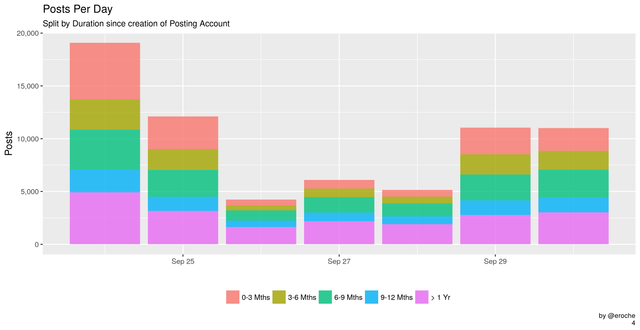 Focusing on the numbers/frequency of posts (i.e. ignoring payouts) we can get a feel for who is posting as well as the level of account activity. In the past 7 days there was a total of 68k posts from 21k unique accounts. That gives an average of 3 posts in the week for authors that were posting. The next graphs shows the breakdown of these figures on a daily basis. Posts are at less than half the level they were before the hardfork. Daily counts give a high level overview but we can examine subdivisions or groups of authors to get further insights into who is posting. The colour in the following graphs represent different cohorts of Steemit Accounts. It can take a while to build your reputation and the system is designed so that it is easy to lose it. You don't want to get downvotes from people with higher Rep! 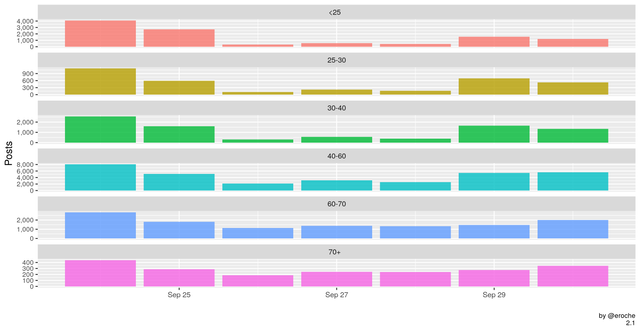 The next few graphs examine how many posts per day are made by people of different Reputations. 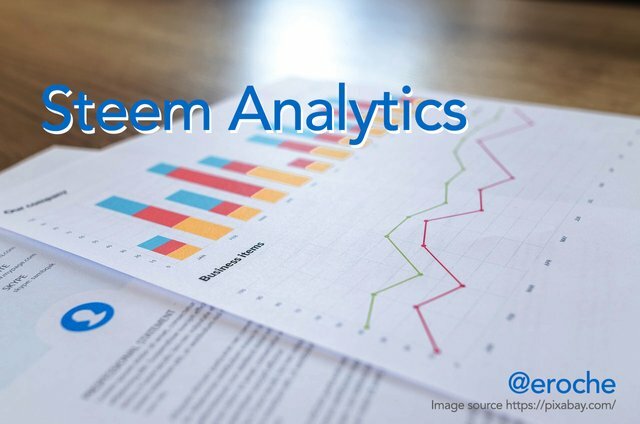 Steem is a stake weighted platform. If you have more stake your vote is worth more. The next few graphs examine how many posts per day are made by people with different levels of Steem Power. The first accounts were created in April 2016. We are now over the 1.1m account mark. Absolute number is important but retention is also important. How many people who joined over the course of the last year are still posting? Who is creating the bulk of the daily content? 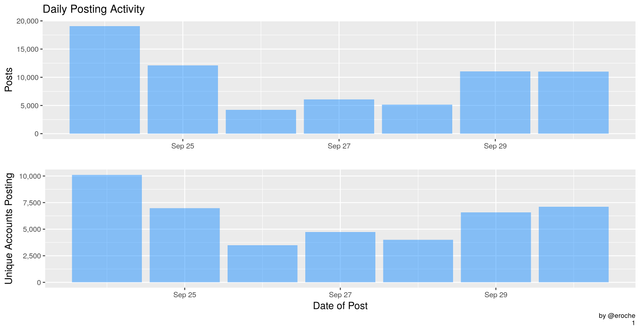 The next few graphs examine how many posts per day are made by people that have been on Steemit for different lengths of time. If there is one, what is the number of comments a day that we could use to identify automated accounts? I would propose anything higher than 4 posts per day (on average) uses some sort of automation. This number may not be correct but it's a starting point for our analysis. Automated accounts may post daily reports or in some cases may just be people spamming the system with low quality content or content copied from other sources. Not all automated posts are bad and some provide a useful function such as daily statistics, market analysis etc. Splitting out these automated accounts will be more relevant for comment activity however it's also worth tracking for posts. 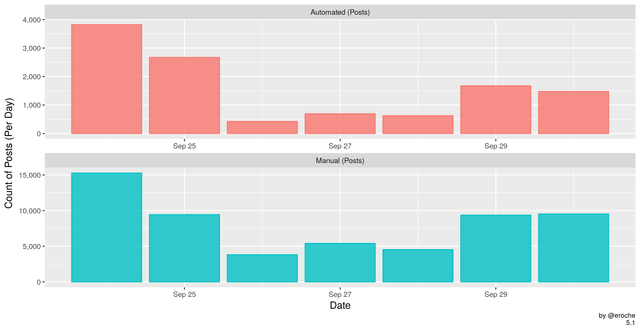 The next few graphs examine the daily posts that are in some way automated. 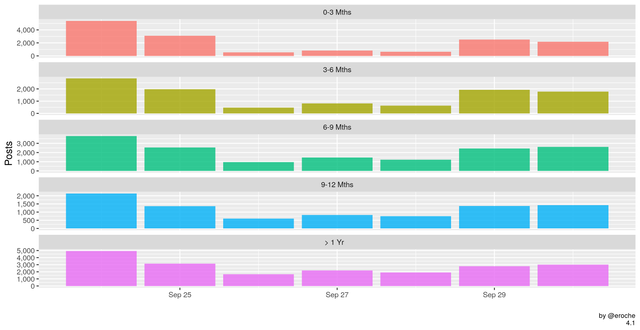 @arcange produces daily reports with really useful data. #blockchainbi and the members of the @Steemitbc community, spearheaded by @paulag, produce detailed analysis on all things related to Steemit. What area of this report did you find most useful? I would love any feedback to improve or clarify any of this analysis. Thank you for reading this. I write on Steemit about Blockchain, Cryptocurrency and Travel. 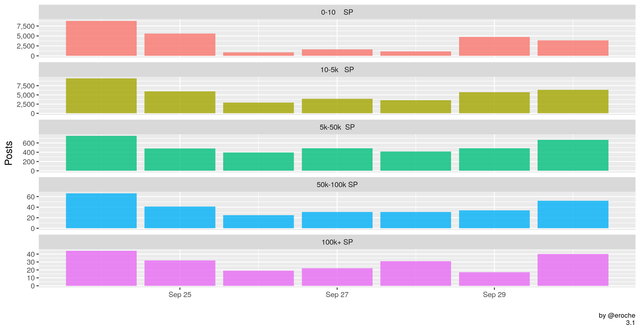 It is certainly interesting to see by the graphs how this week played out. Lovely detailed analysis... a real evolution in clartity with the nice colour coding... clearly shows the relarionship beteen 'status' and higher levels of output. No surprise there I guess. NB yr categories are overlapping! Just perfect. Bad timming but perfect analysis. Last time we'll see a large drop after a hardfork. Testnet is coming. Nice. By 4 posts a day as a bot do you mean top level posts? 4 comments a day would be normal I would think?